Akoya by Damac, a 42-million-sq-ft luxury golf community off Umm Suqeim road in Dubai, UAE, has made significant progress since its launch 19 months ago, with the first residents set to make it their home later this year. The $6-billion lifestyle community located in Al Hebya Two, Dubailand, will be among the most luxurious developments in the region, with high-end branded real estate, luxury mansions and villas, serviced apartments, the Trump International Golf Course, a hotel, a 4.3-million-sq-ft private park and entertainment-themed retail walks. The main contractors have all been making good progress on site with more than 2,600 villas and 18 apartment buildings at various stages of construction while the first substation – which will provide 75 per cent of the power to the development – has been completed and handed over. The contract for the second substation has been awarded to Al Jazeera Contracting and the work is expected to be completed in the second quarter of 2017. In addition, more than 95 per cent of the Trump International Golf Club is complete and the golf clubhouse – under construction by Seidco – is more than one-fifth finished with work on the basement completed. Infrastructure on the golf course, being undertaken by Ghantoot Contracting, is under progress and will be completed later this year. In addition, infrastructure work on the Akoya Park, which is handled by Nael Bin Harmel company, will be completed by early next year. All villa packages have been awarded to Pivot, Commodore, Trojan, Delta, GNT and Alrakha and they have reached 50 to 85 per cent completion. Meanwhile, 11 out of 18 clusters of the seven-storey apartment buildings are under construction by different contractors including Ascon, Transemirates, Seidco and Omis, with the contracts for the remaining seven clusters expected to be awarded before the end of this month (July). Among other developments on site, the first cluster of four 28-storey towers called Artesia is under construction. NPC has completed the piling work and the main contract will be awarded shortly. The first full year of development was capped off in flamboyant style, when both Donald J Trump and Ivanka Trump visited the project, with Trump stating it was “going to be a huge success”. A sample of their interiors. 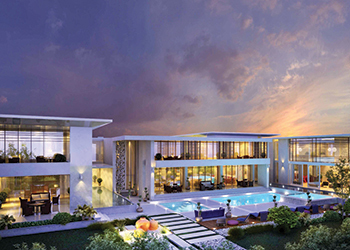 Akoya by Damac includes an eclectic mix of luxury, limited edition, bespoke villas and mansions. 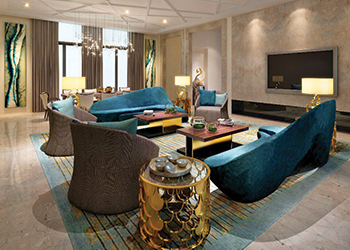 Buyers can select from a variety of finishes and services, including The Fendi Villas with interior designs by Italian fashion brand Fendi, the pinnacle of white glove service and style in Trump and the first-ever serviced living villas in Damac Villas by Paramount Hotels and Resorts. Buyers can also create their own dream home, with plots for large-scale mansions available with options to develop the land privately. “Never before has there been such a varied mix of real estate, retail and lifestyle options all in one location,” adds McLoughlin. Add the international schools, mosques, clinics and spas plus the highly anticipated ‘Drive at Akoya’ – a retail, dining and entertainment strip – and Akoya by Damac is set to become the focal point of the local community. The Drive at Akoya ... retail strip. 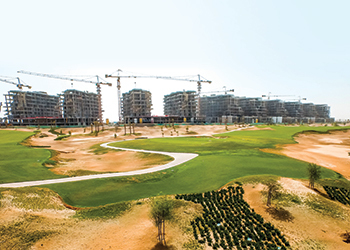 The luxury golf community off Umm Suqeim Road in Dubai, which is almost 15 per cent larger than Central Park in New York City, US, is one of the largest master-developments under comprehensive construction in the UAE. Overlooking the Trump International Golf Club, Dubai will be luxury property, including the Trump private mansions which offer the pinnacle of Trump service standards, set within a private, island location. The Fendi Villas – a world first – will also have their own private, security-controlled access. Fendi Casa home furnishings and décor will be used throughout this limited edition collection. “If Hollywood style and glamour is more to your taste, the Damac Villas by Paramount Hotels & Resorts offer the California cool lifestyle synonymous with the 101-year history of Hollywood’s only remaining movie studio. “From each of these private communities, owners can step out into Akoya Park and experience the peace and tranquillity of a luxurious green space. 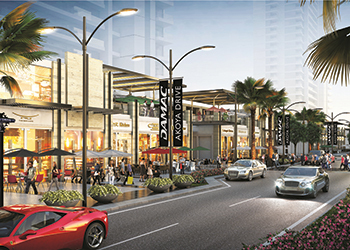 After a cycle around the park, maybe head for a coffee with friends in Downtown at Akoya or go shopping along the retail strip, The Drive at Akoya. From a golf putting green to extensive kids play areas, outdoor ice rink and open air cinema, The Drive at Akoya is set to be the new haute spot in Dubai. “We have worked tirelessly to make sure we include everything a family would need, without ever having to leave Akoya by Damac,” says McLoughlin. The first projects in Akoya will open later this year, with the full community open and operational in 2019.